While I'm fairly comfortable in the kitchen, with or without a recipe, I have to admit that Thai food has eluded me a bit. Until fairly recently, it was simply a cuisine to be enjoyed at a restaurant, prepared by far more capable hands. 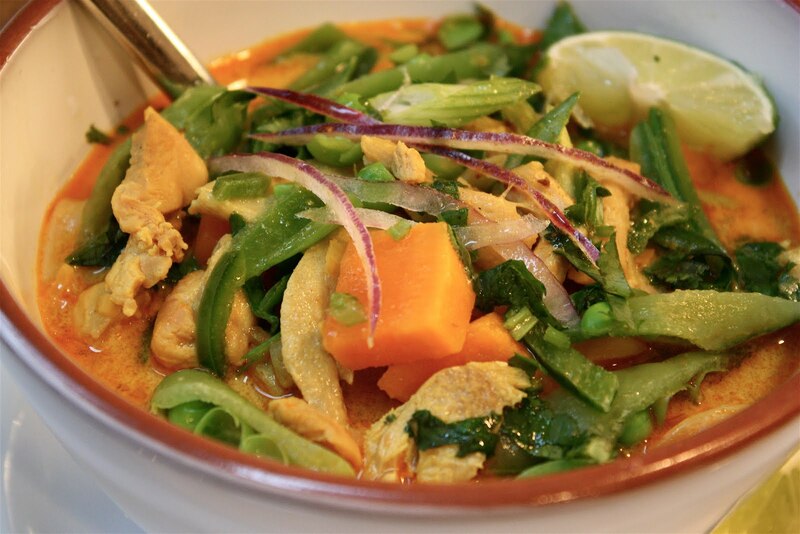 There are just SO many spices and sauces that are used in Thai cooking...as many as 20 that are routinely used in truly authentic dishes, even if in just miniscule amounts. Those adept at this cuisine (like a certain friend of mine) know how to add a dash of this or a pinch of that to make their dishes sing. I believe it takes a certain familiarity with these ingredients to confidently use them; to understand the flavors they impart. And, most importantly, to know what's missing when the dish needs a little something to get it right. There's a bit of an art to balancing the four essential tastes in Thai cooking: salty, sour, spicy, and sweet. An art that is not easily mastered. Much of the enjoyment I find in everyday cooking is the simple pleasure derived from just tossing together a bit of this or that...until you end up with dinner. While I have a load of recipes I've accumulated over the years, truth be told, only a portion of these get followed to the "T" after they've been tested a few times. Familiarity breeds confidence... an ability to take a quick peek at the ingredients and then kind of wing it from there. It's really just an extension of knowing what you like...not rocket science. It's a creative effort. I also think it's a practice that improves your skills and hones your ability to get flavors right...through simple trial and error. In our home, this particular approach has been coined "punting." I'm not sure how or why we ended up with a football reference, but punts are fairly common in my kitchen. Unless, however, we are talking Thai. I just never felt confident enough with the various spices to attempt this practice with this cuisine. I knew a solid recipe would be needed to venture into this new territory. And then this little Asian noodle soup happened along. I think the recipe is from 2008 or early 2009...and, best I can tell, it's a Bon Appetit recipe. While I may not be entirely sure of the timing or publication, it is attributed to Mai Pham of Lemon Grass restaurant in Sacramento and the thing that really grabbed my attention, other than the list of yummy ingredients, was the bold caption that appeared at the top of the recipe: "Dish of the Year." I figured that was about as good a recommendation as I was going to get. Though I'm certainly no more prepared to offer up a punt when it comes to Thai cuisine, I have made this particular soup a few times now and have comfortably adapted it to my own liking. As is true with most Thai dishes, this soup begins with a paste. 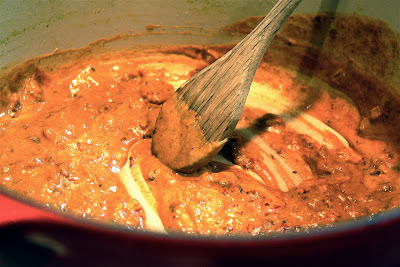 (I used a bottled variety, as is called for in the original recipe, but truly authentic Thai pastes are traditionally made by grinding a variety of spices and herbs. Maybe in another life!) 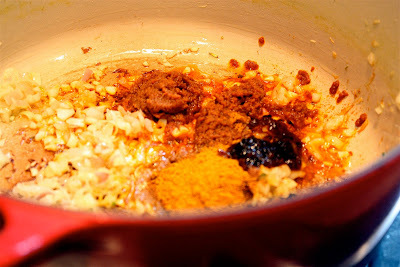 This yellow curry paste -- along with the addition of chopped shallots, garlic, lemongrass, and some of the solids from your coconut milk -- is what forms the base of your broth. And, for a soup like this...it's all about the broth. Once you've got the whole thing simmering away, you simply drop in your chicken to cook right in the hot liquid and then add some pre-cooked sweet potato. The rest of the dish consists of flavor-packed toppings...red onions, green onions, cilantro, and jalapeños...that perfectly balance the sweeter notes of the soup; snow peas for a little crunch; and, of course, silky rice noodles to add a bit of slurp-y substance. For the final touch..and perfect tang...you serve it all up with several wedges of lime to squeeze over top. 1. Bring a large pot of water to boil over high heat and season with salt. You will use this same pot and water to individually cook your peas, potatoes, and noodles. 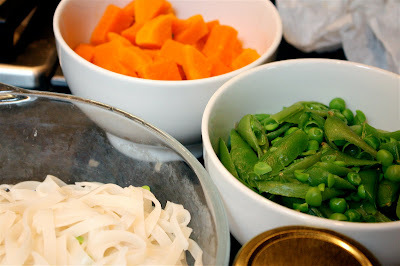 Begin by adding your snow peas to the boiling water and cook until bright green, about 20 seconds. Using a strainer (do not toss your water!!! ), remove peas from pot and rinse under cold water to cool. Set aside in a bowl. Bring your pot of water back to a boil and add sweet potatoes to cook until tender, about 5 to 7 minutes. Remove potatoes with a strainer and rinse under cold water to cool. Set aside in a bowl. Again bring your pot of water back to a boil and add your noodles. Cook noodles until tender but still firm to bite, about 5 or 6 minutes. Drain and rinse noodles under cold water to cool. Transfer noodles to a microwave-safe bowl and set aside. 2. Rinse and dry your soup pot and return it to the stove to prep your broth. Add olive oil to your pot over medium heat. Add shallots, garlic, and lemongrass *(remove tough outer leaves of lemongrass stalks and use only bottom 4 inches of stalk for mincing). Stir until fragrant, about 1 minute. Reduce heat to medium-low. Stir in curry paste, curry powder, and chili paste. 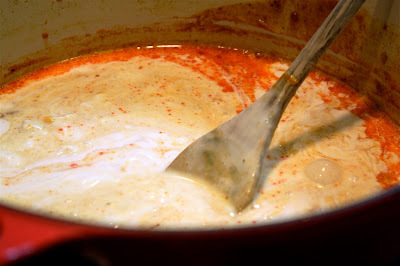 Add 1/2 cup coconut milk (scooping only the thick liquid from the top of the can). Stir until mixture is thick and fragrant, about 2 minutes. Add remaining coconut milk, broth, fish sauce, and sugar. Bring broth to a boil and add chicken. Reduce heat to medium and let simmer until chicken is cooked through, about 10 minutes. 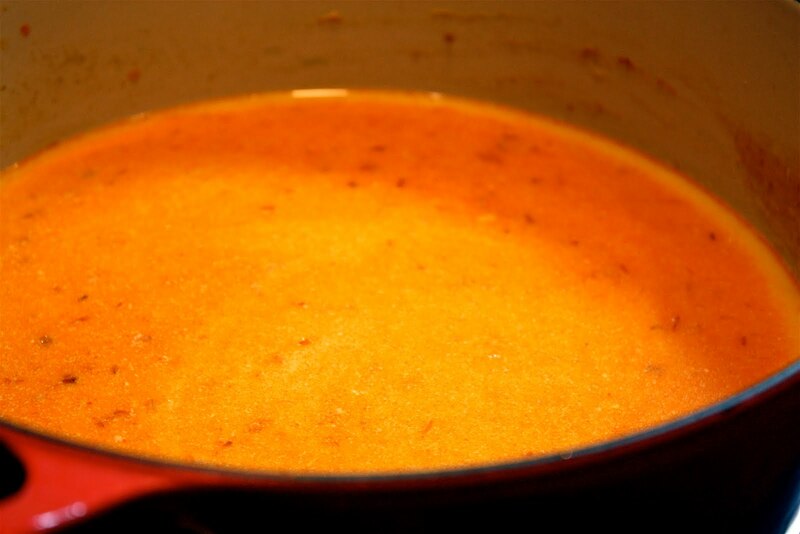 Add cooked sweet potato to soup. Season with salt and pepper, to taste. Keep warm. 3. While soup is simmering and chicken is cooking, chop up your toppings (unless you've already done this!). When soup is ready, place some noodles into each serving bowl and ladle soup over noodles. 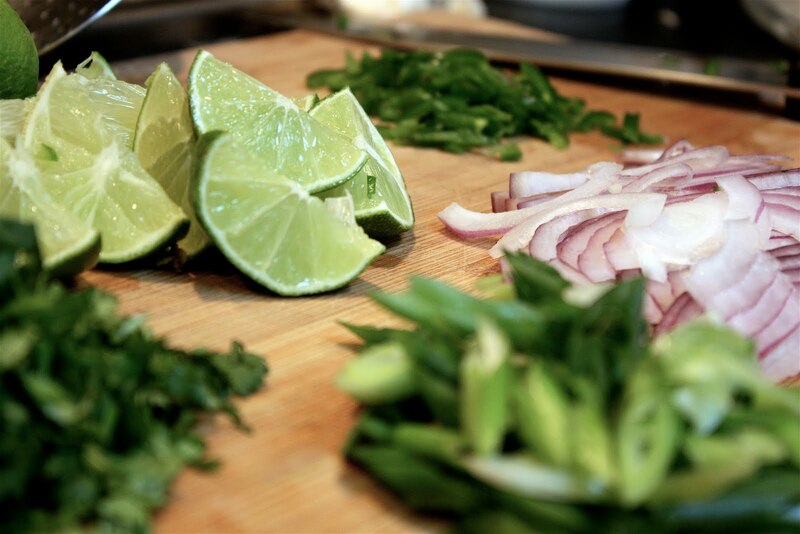 Top each serving with snow peas, red onions, green onions, cilantro, and jalapeños. Serve with several wedges of fresh lime to squeeze over top.